With the opening of the St.Lawrence Seaway this week for another season, the tug Genesis Victory out of New York is headed for the Great Lakes again. The tug with its tank barge GM 6506 has been a regular on the Great Lakes, spending most of the summer there and leaving in the fall. Last year it was not until April 19 that it passed up through the Seaway locks leaving again October 22. 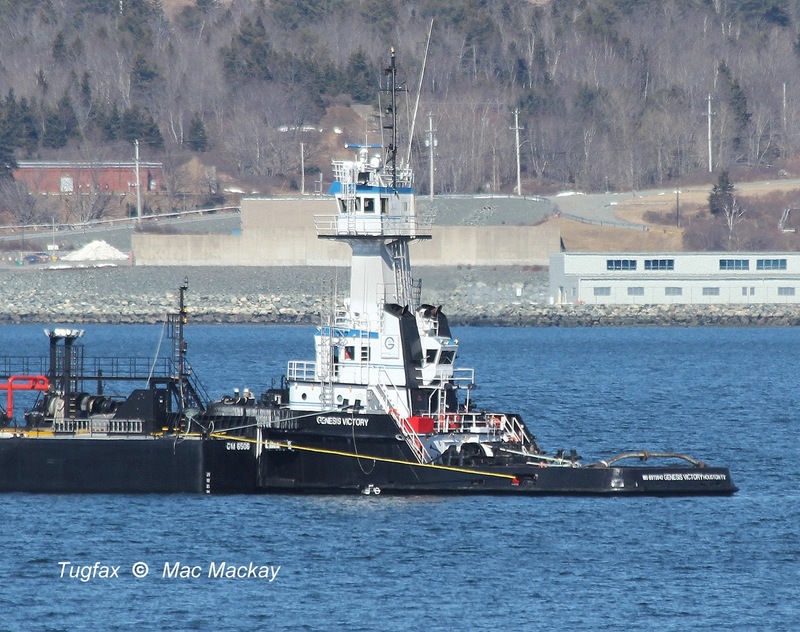 Anchored in Bedford Basin, the barge's towing bridle can be seen draped over the bow. 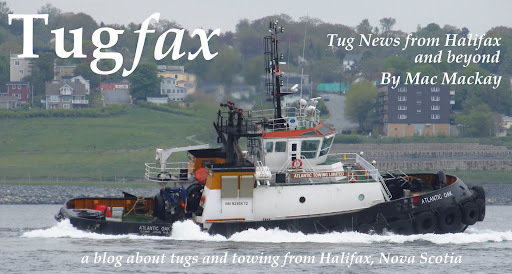 The tug tows the barge in the conventional manner when at sea. The tug was built in 1981 by Halter Marine of Lockport, LA as Eric Candies and was renamed Huron Spirit in 2005 when acquired by Hornbeck Marine. It was modified with the addition of an elevated wheelhouse and other gear when it was paired with Energy 6506 a 5778 grt/ 4499 dwt tank barge, built in 2007 by Bollinger Fabricators Inc. The tug is a twin screw, powered by GM EMD engines totaling 3,000 bhp. Genesis Victory is secured in the shallow notch of the barge, using face wires. Hornbeck sold its fleet to Genesis Marine Co of Houston in 2013, but the tug did not become Genesis Victory until 2015. The barge was renamed GM 6506. Their Great Lakes work seems to be on Lake Michigan, working out of Whiting, IN. 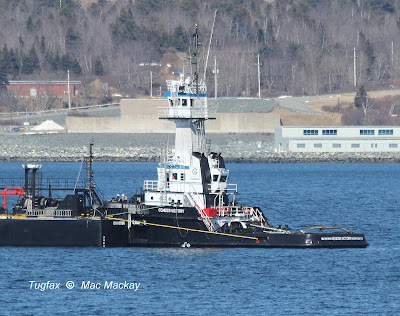 The tug and barge usually use the Canso Canal to reach the Gulf St.Lawrence, but since that facility will be closed for renovations until May, they may be waiting for better weather before proceeding on their trip around Cape North. An anchorage in Bedford Basin is generally used for stays longer than a day.